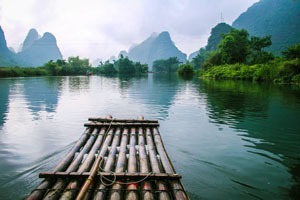 The Li River is one of the best photography destinations in China. The river is lined with karst pinnacles on both sides, and is renowned as one of China&apos;s most beautiful rivers. The suggested time for photography is from May to October. During this period daytime is longer and the temperature is hot/warm with good light. November to February is the low water season. 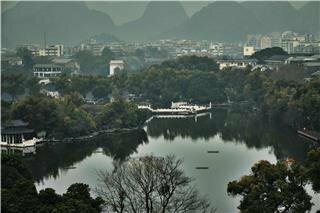 Guilin&apos;s mountains and water are a unity in reflection: when the water shines like a mirror it is difficult to tell which is the mountain peak and which is the reflection. With the fast development of tourism, there are many cruise ships and fishing boats on the Li River. So, if you wish to take photos of quiet scenery with fantastic reflections in the water, the best time is early morning or late afternoon. 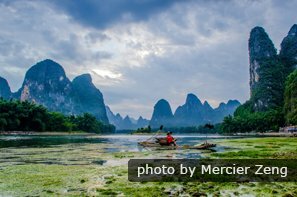 To get a nice photo of the groups of mountains in Yangshuo, choose a high place, especially when it clears up after a storm, or the sun rises from the horizon, or when fog and clouds are formed. At that time the views are stunning. It is suggested that you climb to a mountain top to wait for the dawn, bringing a torch, some water, and food. 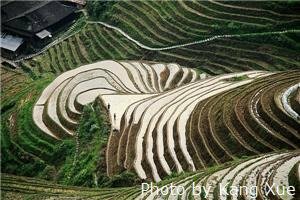 Xialong has beautiful hills, farmland, and orchards. On rainy days the mountain peaks are surrounded by mist. On sunny days the blue sky and white clouds can all be seen in the river. Many photographers come here every year for good photographs. The best photography spot is on the shoal. Our guides know the place, and can help you get there. Nine Horses Fresco Hill is located 4 kilometers northwest of Xingping Town. 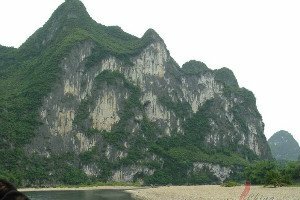 It is on the east bank of the Li River, and is 400 meters high and 200 meters wide. The stripes on the hill look like nine horses, vivid and fantastic. Photographers and painters love it very much. Xianggong Hill is on the west shore of the Li River, between Huangbu Tan (Yellow Cloth Shoal) and Nine Horse Painting Hill. On the hill top you will see the winding Li River is cradled in the arms of hills. The sunlight and shadows, seas of clouds, sunrises, and sunsets are all deeply loved by photographers, and those who love photography. The best time for photography at Xianggong Hill is early morning. The fee for the site is RMB 60 per person. If your equipment is heavy you can get a village man to take it. 50 yuan is required for the service. The reflection at Yellow Cloth Shoal (which is not far from Nine Horse Painting Mountain), is one of the most famous sights of the Li River. Morning is the best viewing time. Photographs taken later will not have a clear view of reflections as the sunlight will be directly from above and shining into the waters. Since the art of photography was invented, many foreigners have come there since the Qing Dynasty (1644–1911) and photographed this area this area extensively, and it is said that if you connect all the films used there together, the length will be more than that of Li River itself. The optimum angle to enjoy the reflections of Yellow Cloth Shoal is in the quay, where there is an old man who charges 5 yuan per person for its use. Arrive in the early morning, before sunrise: 5:30am in autumn and winter, and still earlier in summer. The most suitable time is between May and October. The angle of the sunrise had moved out of the river when the writer came in December. 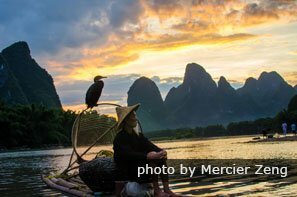 This spot on the Li River near Xingping is a paradise for photographers and painters. 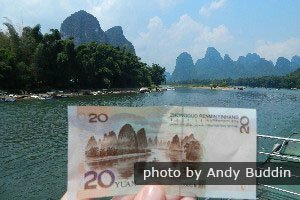 It is the scene that has been printed on the 20 yuan bill since 1999. You can take photos from a boat when the flow is not too strong. During the daytime you can take photos of blue sky, sunlight, and clouds. 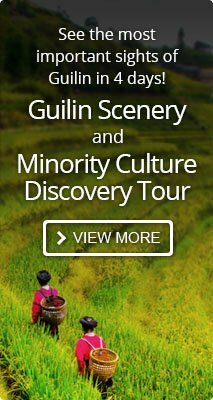 In the evening you can rent several fish boats, turn on their lights, and stage your own traditional Li River fishing scene. 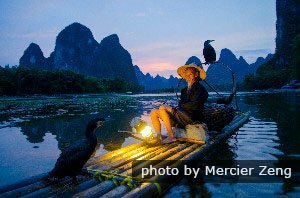 The fishing lights on the Li River is a well noted scene. When dusk falls fishermen turn on their lights one by one, and send their cormorants out to fish. Nowadays there are fewer fishermen, so if you wish to take such photos of fishermen complete with attire you will have to arrange for it in advance. The best place for photographing the fishing lights is at Xingping or Yangshuo Bridge. Laozhai Hill is on the Li River side of Xingping. The Li River turns 90 degrees, then flows towards the ancient town. There are roads to the top of the hill. 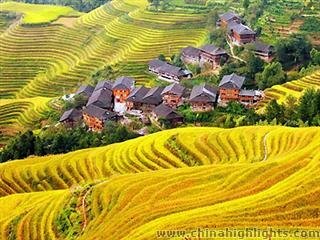 From the top, you can get a bird&apos;s eye view of Xingping. It is the best place to take a photograph from a high angle in Xingping. 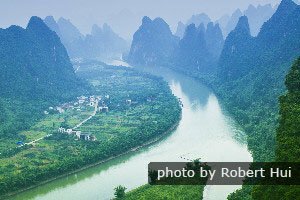 At dawn on Laozhai Hill, facing east you can shoot the dawn, and facing west shoot the Li River morning mists. In the afternoon, facing west shoot the sunset, and facing east snap the scenic paddy fields. Zhuobi Peak is on the east shore of the Li River in Yangshuo. It is a hill shaped like a pen, with a small top and round bottom. The ground at the base of the hill is where Impression Liu Sanjie is held. This hill is very special among all the mountains. The best place to take photos is on Yangshuo Bridge. Shutong Hill is on the east shore of the Li River, downstream of Yangshuo Bridge. It looks like a boy serving in a scholar&apos;s study. The scene there is like a poem. Due to the fairytales about it, it is quite a popular place. The best time for photography is in late autumn, when the leaves are red.